Canadian doom band Zaum will release their debut full length Oracles on I Hate Records June 13th. In support of the release, the band has announced a lengthy tour that will take them across Canada and Europe starting later in the month. Zaum’s emphasis is on doom that explores elements of the old middle-east, and you can stream the fourteen minute track “Omen” below via Bandcamp. It’s an absolutely stunning track that draws you in with spacier melodies and utilizes every second of its longer run time. Hopefully U.S. dates are in the works for sometime next year, but if you’re in Canada or Europe check out the full list of dates below. (Moncton, NB) – ZAUM have announced the dates for a summer/fall Canadian and European tour in support of their new album ‘Oracles’ due out June 13, 2014 on veteran Swedish label I Hate. The band will join forces with Halifax atmospheric post-rock band Kuato for a dual album release tour throughout Eastern & Atlantic Canada this August, and later this fall will trek to Europe for an extensive 31 date tour throughout September-October. The album’s single ‘Omen’ can be streamed here. The 4-song, 50 minute full length debut album ‘Oracles’ by the Moncton, New Brunswick based “Middle-Eastern Mantra Doom” 2-piece band can be ordered here – available on LP/CD/Cassette. ^ indicates dates with Bison B.C. 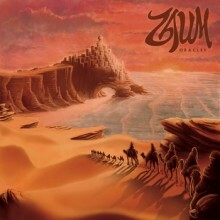 ZAUM formed in 2013 when Shevil frontman Kyle Alexander McDonald and Iron Giant frontman Christopher Lewis forged a musical path toward the dark realizations of the ancient middle east; in the form of a monolithic doomy mantra based psychedelic experience featuring bass and drums integrated with sitar and synth textures. The bands live presence is very true to its recorded form, featuring McDonald’s both melodic and dark vocal styles combined with elements of sectional Mongolian throat singing. Observers experience a calming process of reality whereby the astral and physical planes can co-exist and be understood from a natural perspective. Both members of ZAUM have played shows across North American for two decades in their previous endeavors, now with one sole focused goal of spreading its creations beyond North America and throughout the world.